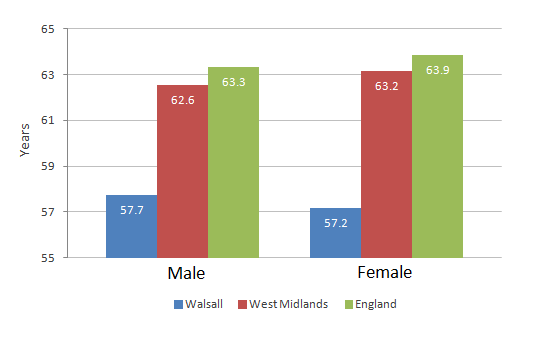 2011 Census results show that overall health is poorer in Walsall than in England and Wales. One in five residents have a limiting health condition: 10.4% are limited a lot, and a further 10.3% limited a little. 77.3% of residents say their health is good or very good – lower than the 81.2% nationally – with 7.3% experiencing bad or very bad health (5.6% nationally). The Borough has adopted the Marmot principles on health inequalities and these principles have informed the Health and Well Being Strategy for the Borough. Overall life expectancy is gradually increasing for both males and females and the gap with comparator areas has shown positive signs of narrowing. However, the focus continues to be on prolonging a healthy life expectancy and understanding and planning for the implications that will have on service need and provision. 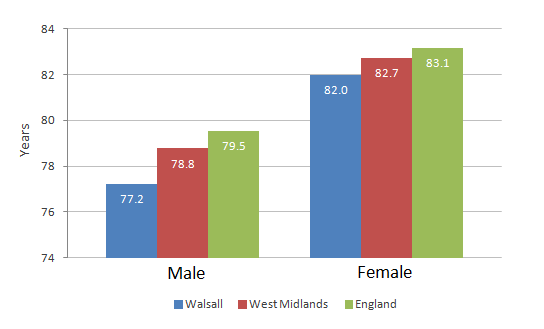 Walsall has a lower healthy life expectancy age compared to regional and national comparators. Female healthy life expectancy is lower than males. 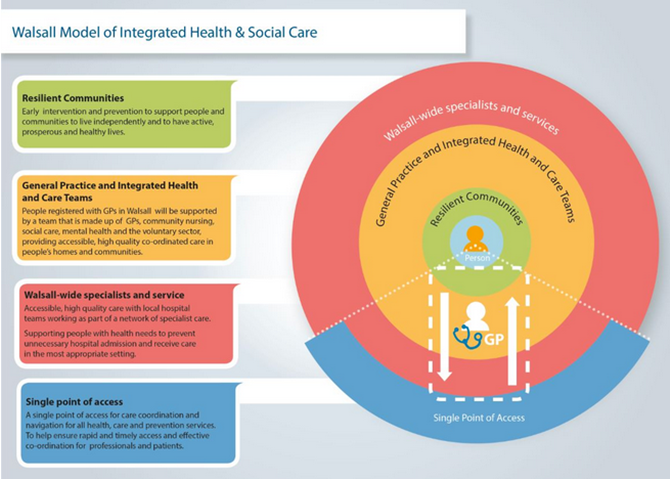 The Black Country Sustainability and Transformation Plan sets out how services across the region will work together over the next five years to improve our collective population’s health and wellbeing, to improve service quality and to deliver financial stability. As part of this wider system of health and care transformation Walsall Together is an exciting programme to transform the health and social care received in Walsall that brings together all the local NHS organisations; NHS Walsall Clinical Commissioning Group made up of GP practices across Walsall; Walsall Healthcare Trust; Dudley and Walsall Mental Health Partnership Trust; Walsall Council, as well as the voice of Walsall residents and key representatives from the voluntary sector: One Walsall and Regional Action West Midlands.